Today’s discussion is Keeping it Real-Today, we’re interested in knowing how you address that question, especially if you’ve been doing this for a while. If you have been around for years, how do you keep your material fresh? How do you continue to keep blogging fun? How do you not only grow an audience, but how do you keep them coming back for more? Think about it, post about it, link to it, and read about how other bloggers are keeping it real, fresh, and fun. Maybe we can inspire each other today! I began this blog as a way to keep track of what books I read. There was one too many times where I bought or borrowed a book, opened it up, only to realize a few pages in (or chapters) that I had read it before. I tried writing a list in a pretty notebook, but found it boring. When I first started looking into starting a blog, I was amazed at how much was involved-plus I am not the most tech-savy person. That being said, I was very nervous when I finally took the plunge and posted my first review. I looked into what I was supposed to do to get viewers, what sites to join, where to get ARCs, etc. I was pretty overwhelmed at first-and even worse, I found very little time to read!! I have just begun to find a nice routine, so I am really enjoying it now. I definitely want to grow my audience and make the blog itself better, but I will do so slowly, at my own pace. I am really liking meeting new people and surprised at how many I have things in common with some, besides reading. Lat month I took part in the Dewey 24 hour readathon, which was a blast. 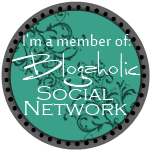 I am so glad I decided to take part in the Armchair BEA, and I al looking forward to Bloggiesta! I, like you, started my blog to share my thoughts on the books I’ve read. I didn’t know much about html codes and such, but in the 3 years I’ve been blogging, I’ve learned quite a bit. I totally agree that you have to do things at your own pace and own way. Otherwise, if you try to keep up with everyone else, you’re likely to burn out. I’ve done bloggiesta in the past and absolutely love it. I get a ton done and have fun visiting everyone else to see what they’re doing. But I warn you – you might end up finishing the weekend with a brand new list as you see what others had on theirs! Bloggiesta is a great event 🙂 This Armchair BEA is my first time and I’ve had a ball meeting new people. Dewey’s 24 Hour Readathon is probably my favorite blogging event. I just love it to bits. I think that’s where I “met” you? Yes, I think it is. I had such a nice time with the Armchair BEA! Taking is slow is absolutely fine. I mean obviously we all started blogging because we love reading, but if blogging takes up all of our time to read then where’s the fun in that? Good post! Thanks! Following you on bloglovin now!